Replicopy offers several options for your printing needs. We have always been on the leading edge of print services. Our latest addition to our printer family being the Konica Minolta Bizhub 65 High Chroma; with new technology it can offer a broader color spectrum than ever before. We offer very high quality printing services at very affordable prices. You can find a overview of all our printing services below. If your job needs inserts, tray cards, wraps or anything printed, we can do that! We offer competitive package printing to make your product custom for you. Our newest printed to get the job done is the Konica Minolta 65HC – High Chroma. It offers a color spectrum outside that of the traditional CMYK offering you more flexibility when it comes to your packaging. Our wide format printing services feature the Roland XC-540 which offers beautiful color. It doesn’t matter if you are small company that is just getting started or a large company needing to update, our printing service can help you. 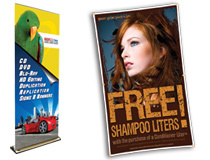 Some of our most popular wide format printing products are banners, banner stands, magnetic signs, and posters. Get yours today! We have tons of promotional products for you to choose from. Our most popular item is the USB drive. We can print your logo, name, address, or practically anything you would like on a USB drive. One of our newest products is the USB business card. Slim and eye catching you can print a beautiful image or logo larger than any standard USB drive so your sure to stand out in the crowd. These drives are sure to make you memorable. Replicopy is proud to announce a technological breakthrough in optical media printing. We are home to the worlds first, direct to disc, industrial digital printer for DVD and CD media. With our state of the art digital optical media printer we can print your artwork directly to the disc and have them ready for you in a remarkably short turn-around time!